Total Score: 8.00 - EDITORS CHOICE! 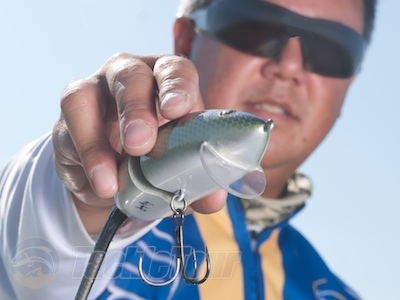 Introduction: As we enter the home stretch of our Year of the Crank, there’s one bait we’d be very remiss in not including in our coverage especially since it has seen a rebirth in 2009. Even though it’s made by one of the storied big bait manufacturers, this bait is, for all intensive purposes, a big, shallow running crankbait. The original Rago Generic Rat debuted roughly ten years ago and immediately became one of those “you gotta have this” baits. The legend of this bait only grew when production seemed to have ended a few short years ago, but according to Rago himself, production never really ended, it just slowed down. Afterall, being a one man shop, he can only produce so many baits at one time and with his Tool series and other baits taking off he had to prioritize based on demand. The Generic Rat had already sold in good numbers, so it naturally took a back seat to allow other baits to capture the limelight. Re-Introducing, the Jerry Rago Original Generic Rat. 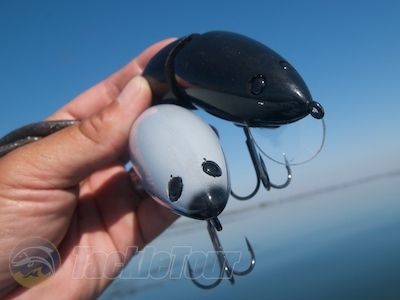 In fact, Rago also came out with a few different versions of this bait, namely the larger Sewer Rat, the diving Crankin’ Rat, the unjointed Generic Rat, and more recently the walking Delta Rat, but the coveted bait remains the single joint version. It is, afterall, the original. Earlier this year, he dusted off the molds and the Generic Rat is once again available in good numbers. Impressions: The Generic Rat is pretty simple looking bait by appearance but it actually took several years and a few different iterations for Rago to dial in just right. It features a four and a half inch, single jointed body, with a long plastic tail, single hook and diving bill. Rago estimates he’s sold over seven thousand versions of this bait and each one was hand built, tuned, and painted by him. Rago did license the bait to Stanley recently and while Stanley was able to sell approximately eight hundred versions of the Generic Rat, somehow these massed produced versions never gained a following. Afterall, it is difficult to compete with the hand made, tuned, and painted Original. What makes this bait so special? Let’s get out on the water with it and find out. ... and weighs approximately 2.75 oz. Field Tests: Weighing in at just over one and half ounces, the Original Generic Rat is an easy bait to throw on conventional bass gear. In fact, I was using a heavy cranking rod to throw this bait. Namely the new Cumara Reaction Series CUC-711MH matched with a Conquest 201DC reel spooled with Izorline hollow braid and a fluorocarbon topshotted leader. I had forgotten how much I enjoy my Conquest 201DC reels until now. 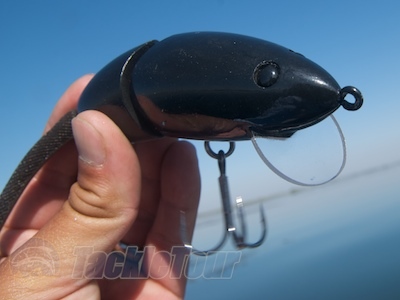 The Original Generic Rat is light enough to toss on heavy crankbait gear. We used the Cumara Reaction Series CUC-711MH matched with a Conquest 201DC reel. Matched with this rod and reel, I was able to really launch the Generic Rat high, deep, and out over intended targets. 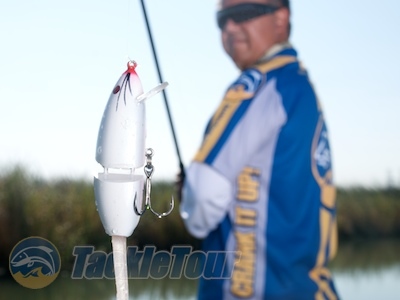 What’s more, thanks to the bait’s single hook, there’s nothing to really foul the bait during a cast, so unless you impart some kind of tumbling momentum into your cast and somehow cause the bait to tangle in your line, you get nearly one hundred percent efficiency out of your casts. The Generic Rat's action is VERY realistic. 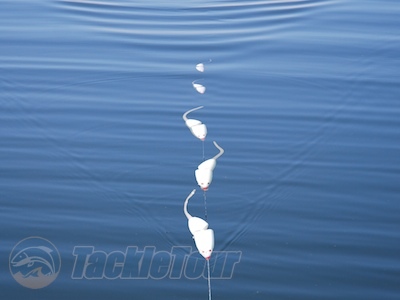 Click the spool over and begin a slow, deliberate retrieve, and you can see the bait leaves just a small wake true, but the real story of this bait is in its motion. It literally snakes back to your position with an action that is really enhanced by the soft rubber tail trailing the body. Slow your retrieve just enough so the bait stays on top of the water and you can hear the enticing, knock-knock-knock, of the bait’s two body sections banging against one another as it swims. Another species in the Generic Rat family is the lipless Delta Rat (left). Pick up your retrieve just a little and the Generic Rat will run subsurface anywhere from six inches to maybe a foot and a half to two feet down. We threw this bait on the California Delta in water with questionable clarity, so it was difficult to get an accurate gauge as to how deep the bait would run. The key bit of info here is if you want it to stay on top, you have to slow down, and if you want it to dive, the faster your retrieve the better. ...from 3.5" to 6.5" (shown here).